These days it is no longer unfashionable to come out, loud and proud, even if you are an "every mama's boy" writ large pop star with instantaneous mass appeal. Just think of Clay Aiken. Unless you happen to be straight, or seemingly so. 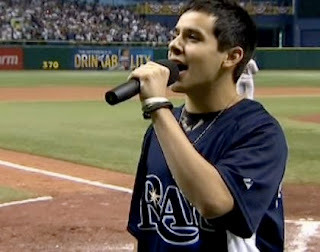 Such is the case of cutie pie, David Archuleta, another American Idol finalist, who has been the target of a gay rumor. In front of thousands of people on Thursday night, October 9, at the cavernous Tropicana Filed in St Petersburg, Florida, at a supercharged, no "sissies" allowed Tampa Bay Rays versus Boston Red Sox game, Archuleta belted out the nationalistic "God Bless America." Gay or no, he can certainly sing his heart out! For those of you who harbor a desire to see this young man come out given that this is National Coming Out Month, well, this event was certainly not the occasion--not in front of thousands of adrenaline pumped baseball goers!